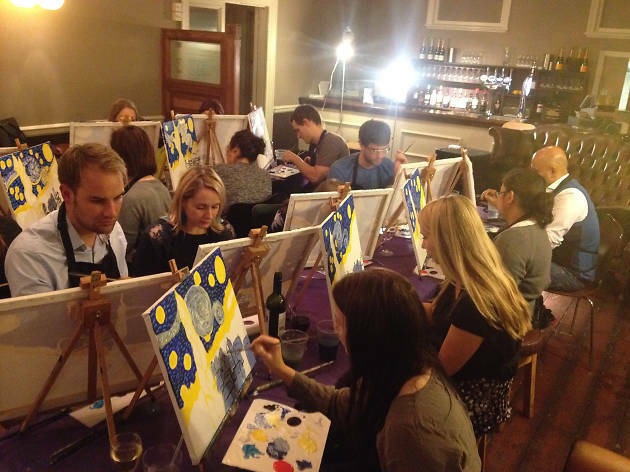 Londoners who feel sure they have it in them to create a masterpiece if only they could find the inspiration can put their potential paintbrush talents to excellent use at one of these artistic sessions. Each event focuses on a different artist (there are regular Banksy, Hockney and van Gough sessions) and participants will recreate one of their most famous works on a huge canvas. All materials are provided and no experience is required. PopUp Painting provide classes to teach people to paint but have fun at the same time. They have a number of different classes throughout the year to paint a famous landscape say. I went along and painted London Skyline which is work originally done by artist Rebecca Hunter. You'll get provided an easel, canvas and paint brushes to paint your masterpiece with. Plus on some classes a glass of prosecco will be provided. It is most certainly a great way to have fun and a great alternate to a date night. If you love art and painting then you will love this. I went to a ‘Paint like Banksy’ PopUp Painting class in the café of the Roundhouse in Camden on a Wednesday evening and had such a fun and relaxing time! Everything is set up professionally, you’re given brushes, paints, palettes, a generous mounted canvas, an overall and a professional painter walks you through the painting in stages! It’s such a fun evening to spend with friends or to make new ones as there were a few who had come solo and at the end of it you have your own ‘masterpiece’ to take home. I would recommend it, it felt rather therapeutic (could also be the bottle of Merlot a friend and I shared). One thing to note is that you do not get a drink included in the ticket even though the descriptions may suggest you do! This was one of the most fun experiences I've had in such a long time. 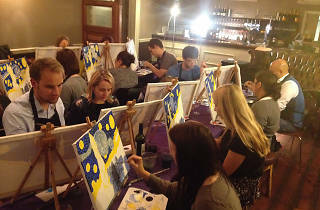 We went to Davy's in Canary Wharf on the riverside for an evening of learning to paint like Banksy. Straight off the bat it was made clear that the evening experience was just about having fun, and shouldn't be taken too seriously. It was well organised and the artist and organiser took us through the painting step-by-step, and gave us enough time to explore our creative sides and learn new techniques and skills. We all walked out with paintings we were proud of, and I would definitely do it again, and recommend to all no matter what your previous painting or artistry skills are.